So I've told you guys before how much I looovee getting my Birchbox every month. My sweet sister in law, Alix, got this subscription for me for Christmas and it has seriously been the best thing ever. I have decided to give you an insight as to what comes in these boxes each month. Might I add how cute the actual box is.. I don't want to throw it away! Let me preface this whole schpill with the fact that I normally shave with only water. I HATE shaving my legs, so I do it as quickly as possible (and most of the time do a terrible job!). So this is blueberry shave cream, yes blueberry!! haha Fortunately, it doesn't smell too strongly. (It actually comes in six different flavors.) It lathers pretty well and you can get a really good shave with it! I will note that I cut myself, which I never do.. Ehh I prob wouldn't spend $20 on a big bottle of this. But.. This face cream smells amazing and feels soo good when you put it on. You know that tingly, calming feeling. However, I didn't feel like my face was moisturized 5 minutes later. Living in dry Southern California, I have to put on moisturizer twice a day. While this smells great, I just need something a little stronger to leave my face feeling moisturized all day. If you have naturally oily skin, this might be the product for you! I try to have my make up routine to under 10 minutes. I don't enjoy putting on makeup, I don't like having a ton of goup on my face, and really I would just rather spend that time in the morning sitting on the couch watching the news. However, this little product is a quick and easy addition to your routine. You put it over your make up to add some extra highlights (shininess) to your cheeks, nose and temple. I'm probably not adding this to my daily routine, but I think it would be a fun addition on a night out on the town! So this box was actually a terrible representation of my love of Birchbox! I didn't fall in love with any product.. but I did have fun trying them out! And let's be honest, the best part about all of this is getting a package in the mail!! 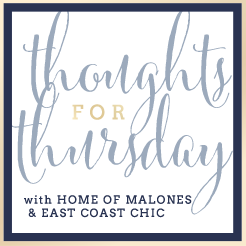 Today I'm linking up with East Coast Chic for Random Thoughts Thursday. Go check her out! !